November, 2016 ~ After babying my nice ‘ukuleles for years on errands and beach days, I finally decided to look for an alternative that could permanently live in my car. 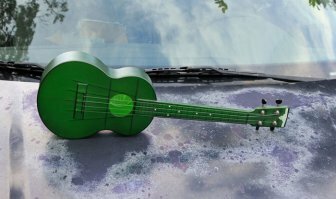 There are several options these days for waterproof, bombproof ‘ukuleles, but the one that caught my eye for quality and sound was the Outdoor Ukulele brand. 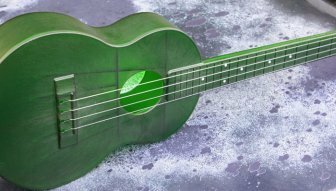 For $150 I easily ordered a green tenor-sized uke from the company and it arrived several days later in a well-packaged box with a sticker. Stickers are always a win. The Outdoor instruments are made from two pieces of polycarbonate plastic (top and back/sides) fused together in the creation process. The polycarbonate is supposed to be temperature resistant up to 400°F and down well past freezing levels: like -40°F. Metal tuners by Grover are the only non-plastic piece – my only qualm about actually swimming with the instrument. I’m sure they would rust. Granted, they are replaceable. The bridge and saddle makes use of the engineering capabilities of a piece of plastic by using little keyhole-shaped slots for the strings. This is a clever design that would be tricky to do on a traditional instrument and makes changing strings easy (provided you can tie a figure 8 knot). The setup? Perfect every time since the nut is formed as part of the neck and fretboard. From the factory, the Outdoor tenor is set up for high-g. I managed to fit a Savarez KF95 low-G string in the stock string slot, but it’s snug. A string any bigger would require some filing. Note that using any wound strings on the Outdoor uke voids the warranty. This leads me to believe that the uke doesn’t appreciate metal rubbing on it. My very first impression of the Outdoor tenor was “tin can.” Just handling the uke makes it ring with a plasticky tone. Like you were banging on a musical 5 gallon drum. Playing the ‘ukulele, a lot of the resonance comes out in the attack of the notes. This creates a very bright and pure sounding tone with a “boing” to it. The resonance can be at times boomy and makes for a very loud sound. Something reminiscent of a steel drum. Because of this I was surprised that sometimes chords lack definition. At the end of the day, for $150 you can certainly find a better sounding ‘ukulele. But if you can get over the unique flavor of the sound, the Outdoor uke doesn’t sound all that bad. Just different and not very ‘ukulele-like. The Outdoor tenor ships with Rye Rabbit (whoever that is) flurocarbon strings. They are great and have fabulous intonation, but seeing as they were starting to wear out, I figured I’d throw some new Savarez Alliance strings on the uke to try out a different vibe. They certainly seemed like an upgrade to me. Of course the difference between low-G and high-g is dramatic, but if you can listen beyond that I believe you’ll hear quite a difference in the sets. I chose to get the green Outdoor tenor and the color very much reminds me of an old beer bottle. Although you can’t see through the plastic, it catches the light in charming ways, appearing to glow sometimes. You can see the bracing pattern inside the uke where the plastic is thicker. What’s to say? It is literally two pieces of plastic welded together. No details whatsoever. Oh, I take that back. There is a sticker on the headstock and another inside the soundhole with the company logo on it. The thing about a computer generated piece of plastic is that it can be very precise and stable. That shines through in the playability of the instrument – which is fantastic. Fretting plastic strings on a plastic fretboard feels a bit funny at first, but you quickly get used to it. The intonation all the way up the neck is possibly the best I’ve ever seen on an ‘ukulele. Even the highest frets remain perfectly in tune – with the stock strings, that is. The Savarez strings I replaced them with don’t tend to intonate quite as well as flurocarbon. The weirdest part about the Outdoor uke is that they neglected to round the neck very much. It’s kind of clunky and flat on the back, which is far from an ideal playing surface. I’m sure it’s only a matter of time before customer demand forces a change, but at the current moment it’s still a drawback. Since I got it back in July, the Outdoor tenor has lived permanently in the backseat of my crappy little car. No case. No babying. And you can’t tell at all. Nothing has warped – even in the blistering car-in-a-parking-lot heat of Kona. It doesn’t get very cold here during the day-to-day so I haven’t had a chance to expose it to the low-end of the temperature scale, but I would not hesitate for a second to take it up on the mountain in sub-freezing conditions (or even to Antarctica). There are a couple minor cosmetic scratches, but surprisingly few for the beating it’s taken. So I assume the plastic must be as durable as you’d think. I’ve zipped it into my backpack for hikes to the beach, stood in the waves while dripping wet, and generally tossed it around without much care. As far as I’m concerned, it’s pretty much perfect in the durability aspect. It’s not perfect, but for a military-grade beater uke made in the USA, it’s pretty cool. I expect it will last a long time and accompany me on many more adventures where I wouldn’t want to take one of my nicer instruments. The neck could really use some rounding to make it more comfy in the hands. It seems a little expensive for what you get. I mean, it’s a piece of plastic. I imagine the premium price more than anything is to cover technology costs for a little mom and pop shop. Which is cool too. No way are the $50 Kala Waterman ‘ukuleles as nice or made in the USA. Other than that, I’m a fan.